I can't claim this design entirely, because I know I've seen similar pieces in the blogging world over the years. This is just my take on a really great design idea! Upon finding a house to buy in Pittsburgh I decided it was *finally* time to reflect a bit on where we've been geographically over the years. 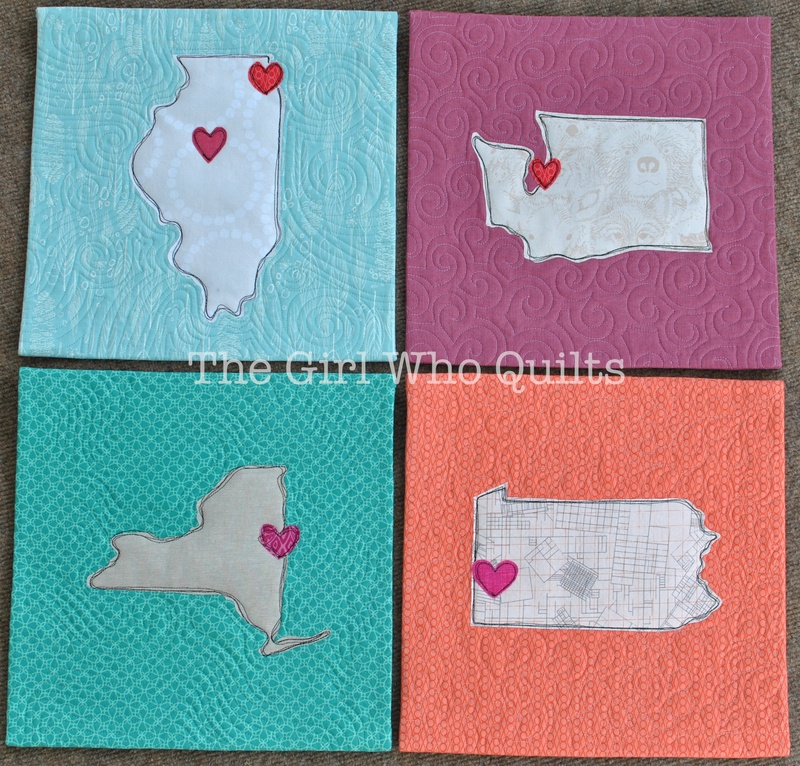 In doing so, I created a mini quilt for each state that we have lived in, highlighting our locations with hearts. Because, you know, Home Is Where the Heart Is, and all that jazz. 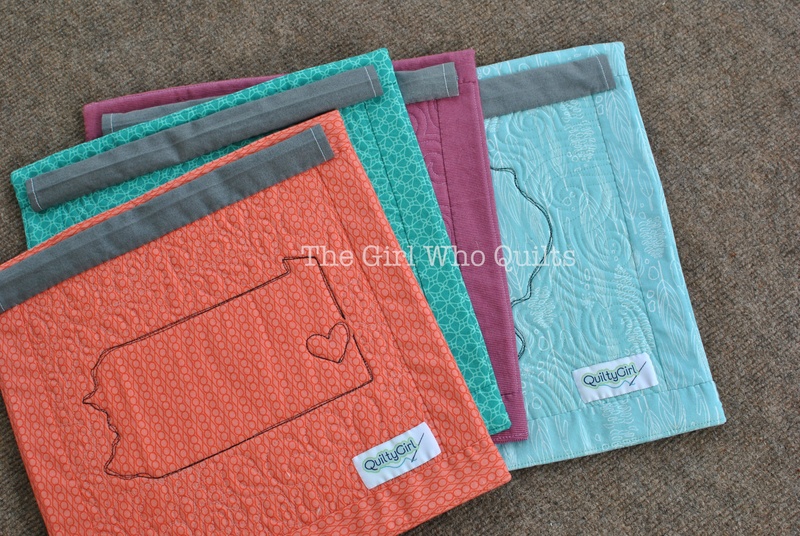 For my fabrics and colors, I tried to stick with jewel tones for the backgrounds and white/cream prints for the states. The hearts are varying shades of pinks and reds. By creating each piece separately and mixing designs, tones, and colors, I have the freedom to add to this collection without disrupting it. Let's start at the beginning! First we have the Illinois mini. We lived in the Chicago area and also in the Peoria area of Illinois. 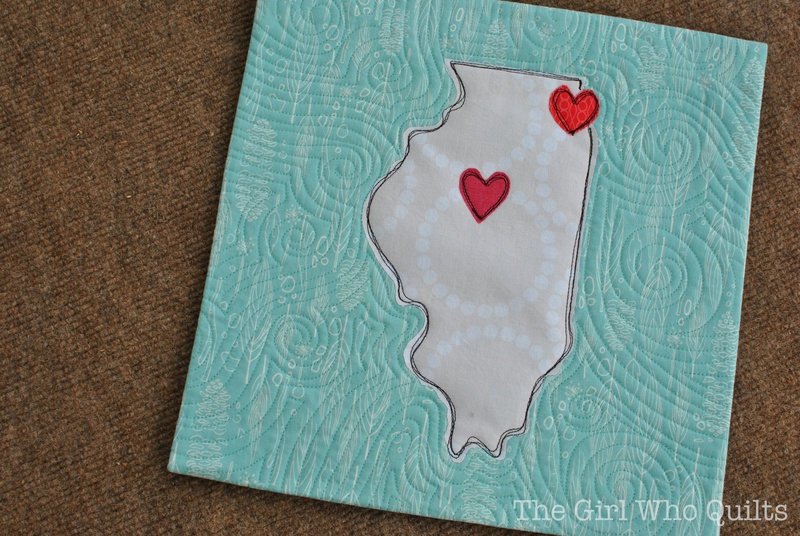 I love the blue print in this mini - while not really a jewel tone, it really reflects the Native American history in Illinois, I think. Next we lived in Seattle, Washington. We lived in a very urban area, right in the heart of Seattle, but it was always clear that we were just steps from nature! From the "green" attitude of the residents to the mountain views in nearly any direction, I had to use a wildlife print in this mini! 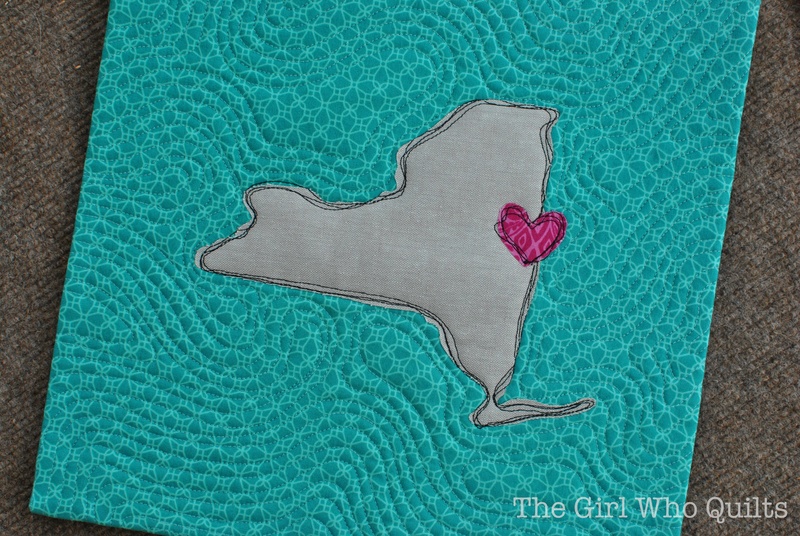 From Seattle we moved to upstate New York, in Saratoga Springs. I used a linen and a vibrate green for this mini. Saratoga Springs is known for its natural springs, and despite being a small town far from NYC, it has a large "crunchy" population. And here we are now, in Pittsburgh, PA! The house we bought in Pittsburgh is an old rowhouse that was completely gutted and rehabbed. The first time we "toured" the house, part of the (new) roof was unfinished and the walls were only framed. So, it seemed quite fitting to use a "blueprint" fabric for this mini! Here they are all together! 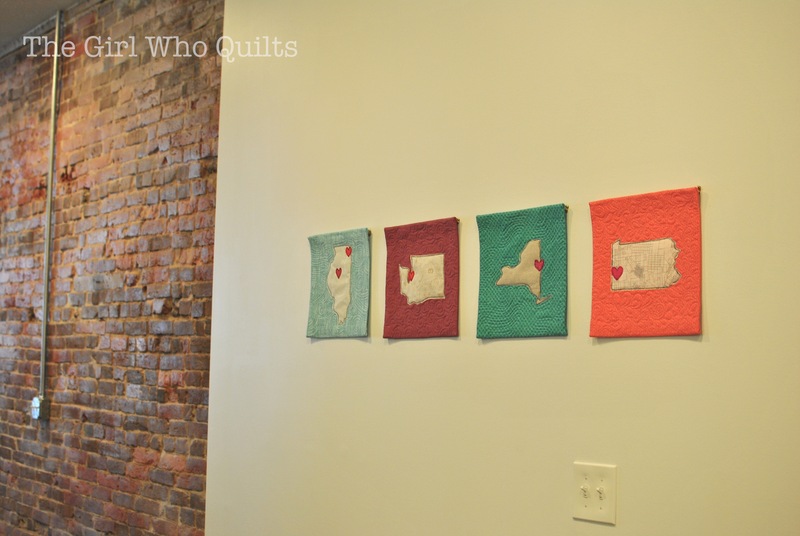 We hung them in our dining area, which is where we tend to end up mingling when we have guests. It's such a fun conversation starter, and I love that they are a prominent feature in our house! 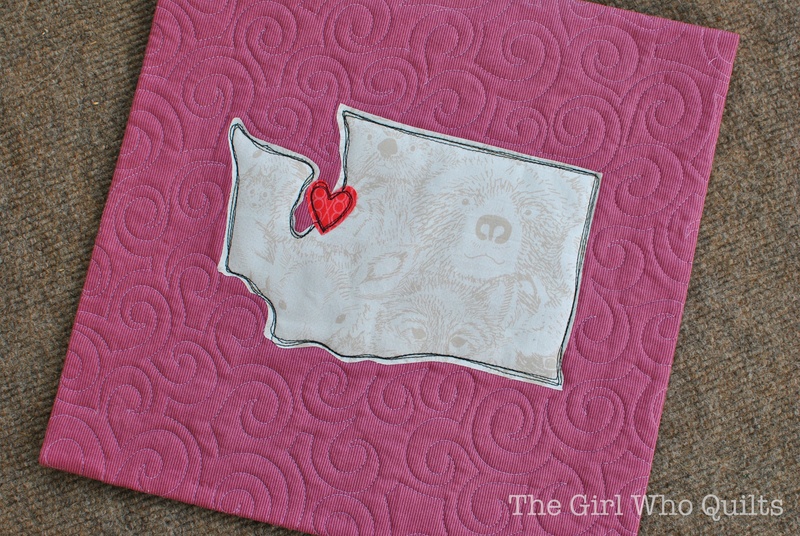 I quilted around the states and the hearts with black thread to really draw attention to the shapes. I found that 3 passes around each shape gave great definition without lots of thread build up. 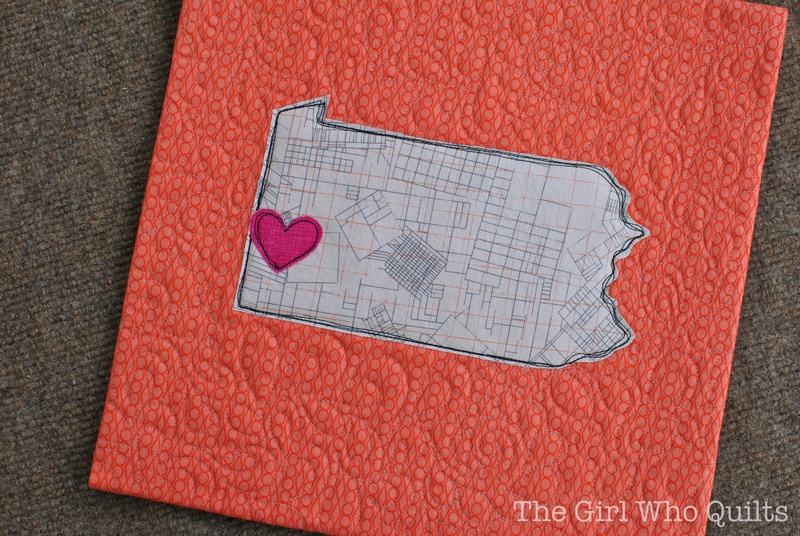 In the background spaces I quilted in various flowing styles with thread to match the background, again to keep the focus on the states. To finish the minis I applied knife edge binding and a hanging sleeve on each piece. The knife edge binding is a bit more time-consuming, but the look is so stunning! Well worth the effort for this project! And one last (poorly lit) picture. Here are the minis hanging in our dining area! The adjacent brick wall is part of the living room, and to the right of the minis is the kitchen. I'd hoped to show a bit more of the house, but lighting was bad when I took this one!